Neil is the pastor of Good Shepherd Presbyterian Church, which is the daughter church URC is planting in Kalamazoo, MI. Neil was born and raised in Lansing, MI, attending URC from infancy through his college years. He attended Michigan State University, receiving his B.A. in philosophy. During high school and college, Neil felt the call to pursue pastoral ministry as he sat under the faithful preaching of the word, and eventually participated in URC’s first pastoral internship program. Neil then attended Gordon-Conwell Theological seminary, where he completed his M.Div. 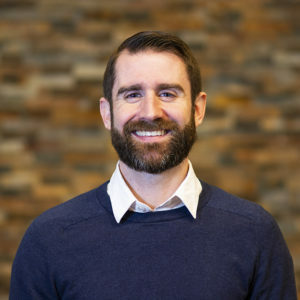 After seminary, Neil moved to the Chicago area where he served at Spring Valley Presbyterian Church, first as a pastoral fellow, then as an assistant pastor, and finally as an interim pastor. Neil and his family accepted the call to lead the church planting efforts in Kalamazoo and came on staff in February, 2017, first moving to East Lansing, and now living in the Kalamazoo area. Neil is married to his beloved wife, Leandra, whom he met at URC and Spartan Christian Fellowship while they both attended MSU. They have three kids, Brielle and Corin, Talitha. Neil is an avid sports fan, who probably loves the Michigan State Spartans a little too much. He also loves to read (especially with his family), play music, and exercise outside. He is thrilled to be part of the work to advance the gospel in Kalamazoo, and enjoys nothing more than preaching the gospel to any who will listen.